This guard has exactly the same external shape and screw holes as a Standard Fender Tele Guard, but it's cut for a regular bridge humbucker surround, neck humbucker (covered or uncovered) and no control plate recess. Just like the photo. 100% full mirror super polished stainless steel pickguard. Mirror guards look very smart on a Telecaster. As the Jim Root style Tele is becoming more popular, it's got to have it's custom bling too. PLEASE NOTE: It's a Super Mirror finish. Be aware that like any mirror surface under physical use, can develop very fine scratching from playing, less if using fingers. But stainless steel is more resilient than a plastic mirror guard which scratches easier & suffers clouding in the plastic. Steel still maintains a high mirror finish, and any fine marks through normal handling and playing are not so noticeable from a few paces away. This guard can also be repolished after extended use. Pro-Steel are very careful with handling and preparation to get you the best Mirror Guard delivered. Fits neck humbucker with cover or uncovered, no mount ring needed. 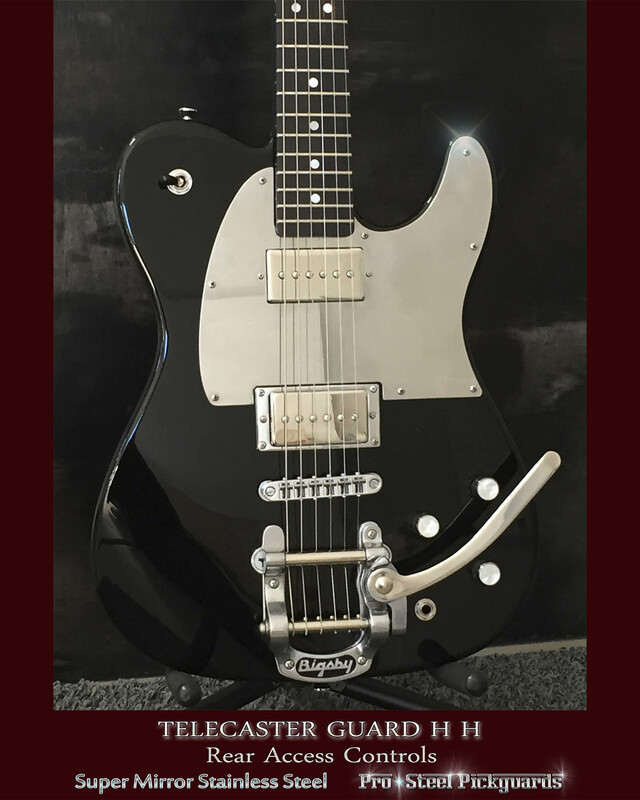 FITS - A Fender Jim Root Tele USA or Squier, or a Fender spec HH Telecaster body rear routed for control access. Bridge Humbucker Cut-out Will Fit: standard Humbucker surround mount ring (plastic or chrome surround ring), OR Gotoh Humbucker Chrome Tele Bridge Plate. Squiers Tele's: Will fit a Squier Jim Root Telecaster. This guard has exactly the same external shape and screw holes as a Standard Fender Tele Guard, except cut for a bridge humbucker and no control plate. See above for Fit.